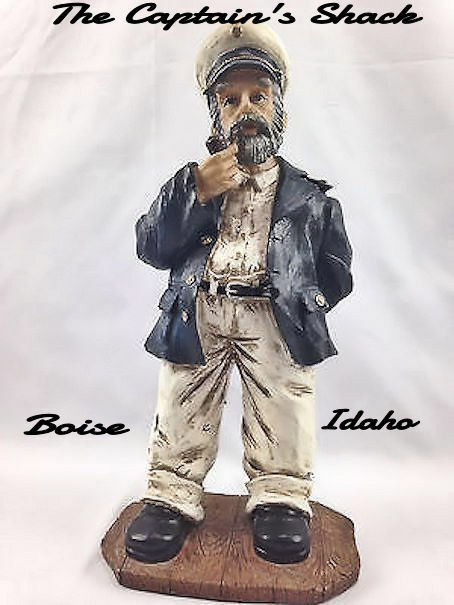 Food, Craft Beer, Nano Breweries, Wine, Idaho Wineries, Winery Bistros, Restaurants and Events, Boise Foodies in the Treasure Valley Idaho. Come see what we are up to and the variety of our eating and wine and craft beer experiences. Look where we and our friends like to eat and have a great glass of wine or craft beer. And if you are in Boise, let us know. 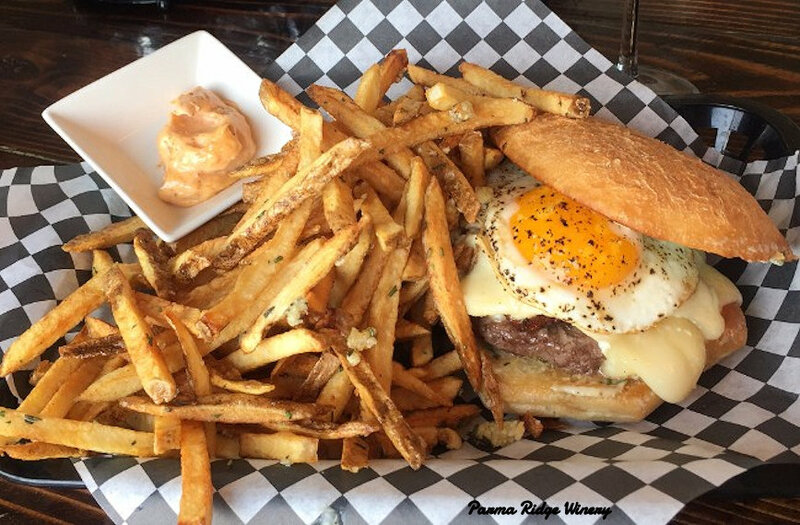 We'll meet you for a bite to eat and/or a glass of craft beer or wine. What is your favorite cuisine? I bet we can find you a restaurant to satisfy your epicurian urge. Cheers! 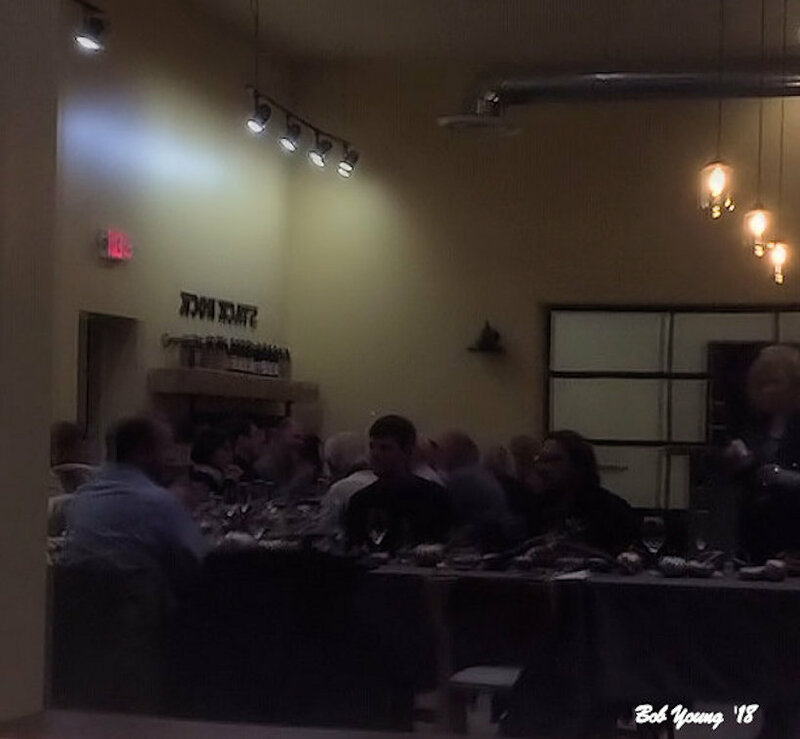 A really good release party at Parma Ridge Winery on April 18. Warm temperatures. Clear skies. Great food. Great wines. Here are the wines that were released and the Tapas we had. Left-Click any photo to see enlarged. 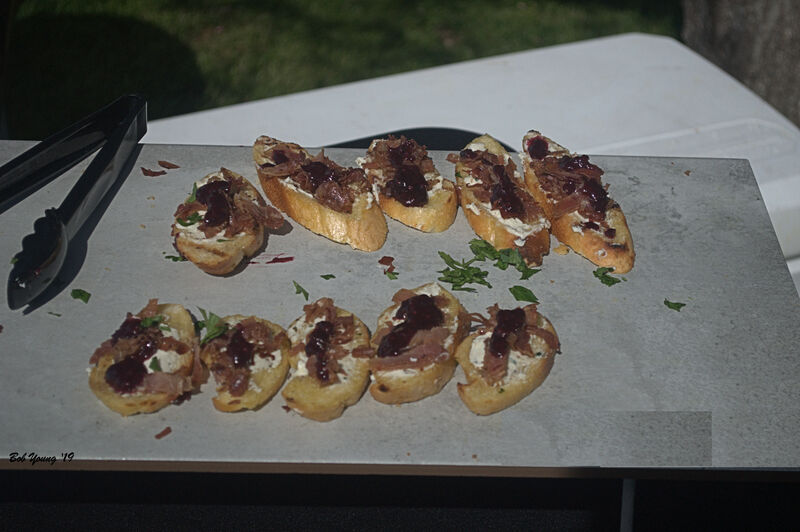 Paring: Crostini with Borsin, Crispy Prosciutto and Blackberry Compote. 2018 Tre Bianchi. 63% Gewürztraminer, 20% Riesling and 17% Viognier. Meaning “Three Whites” in Italian, this full-bodied white features pronounced citrus and melon notes. Paring: Tempura Halibut Bites with Unagi Sauce. 2016 The Last Zin. 75% Merlot and 26% Zinfandel. “The Last Zin” is a final hurrah to our Zinfandel that perished in the hard-freeze of 2016. This estate-grown red is balanced with notes of wild blackberry, smooth tannins and a touch of charred caramel. 2016 Tempranillo. 100% Tempranillo. This Spanish Varietal features subtle spices, roasted red pepper and dried cranberry with a smooth oak finish. 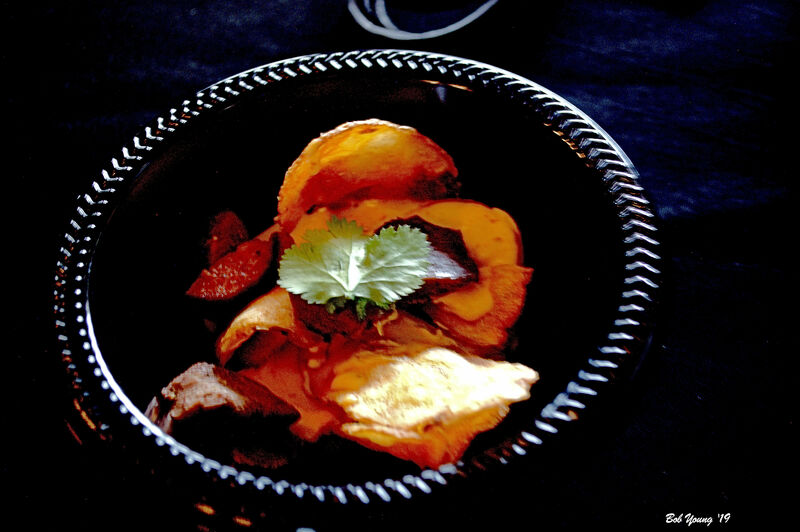 Paring: Fresh Fried Chips and Chipotle Cheddar Dip wwith Smoked Chorizo and Filet Mignon Bites. 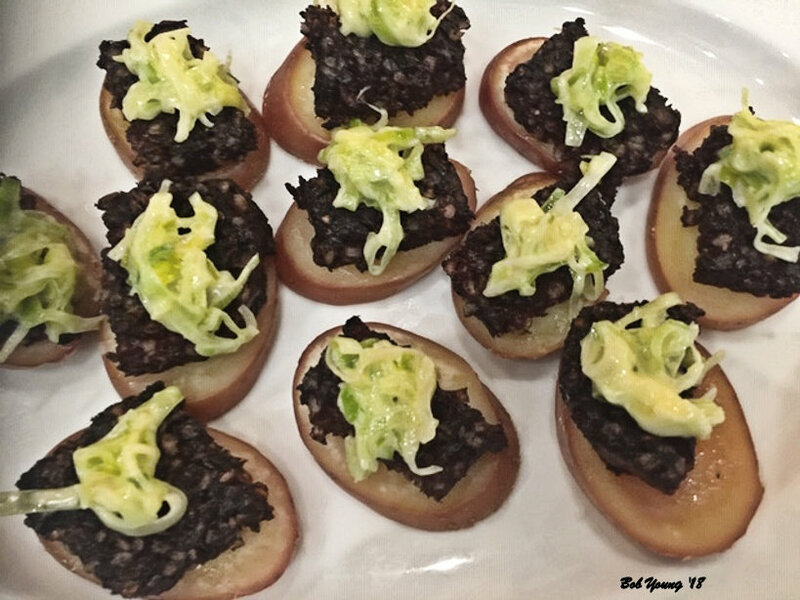 Great Feasts Coming to Parma Ridge Winery Bistro! 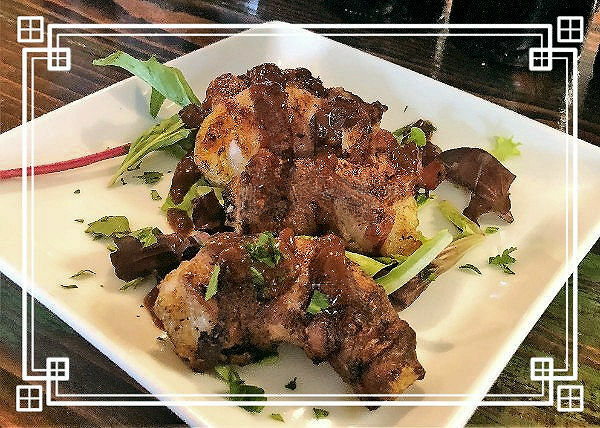 We are open Wednesday & Thursday from 12-5 p.m. for Wine Tasting, Beer and our Small Bites Menu, Friday & Saturday 12-9pm and Sunday 11 am- 5 pm with our Full Bistro Menu, Wine Tasting & Beer. Reservations Required for Dining from 5-9 p.m. Friday & Saturday. SAVE THE DATE! 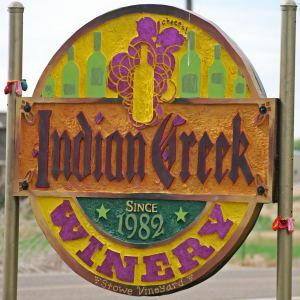 WINE CLUB RELEASE THURSDAY, APRIL 18 from 4-8 p.m. PLEASE RSVP via text at 208-946-5187 or email at info@parmaridge.wine with the time you will be coming. Cards will be charged beginning this week so please let us know asap if you have changes to your club or your card on file. 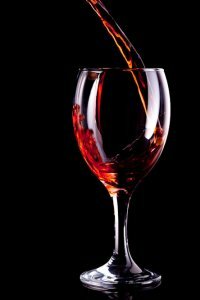 Menu and prizes will be announced in the Wine Club email this week. 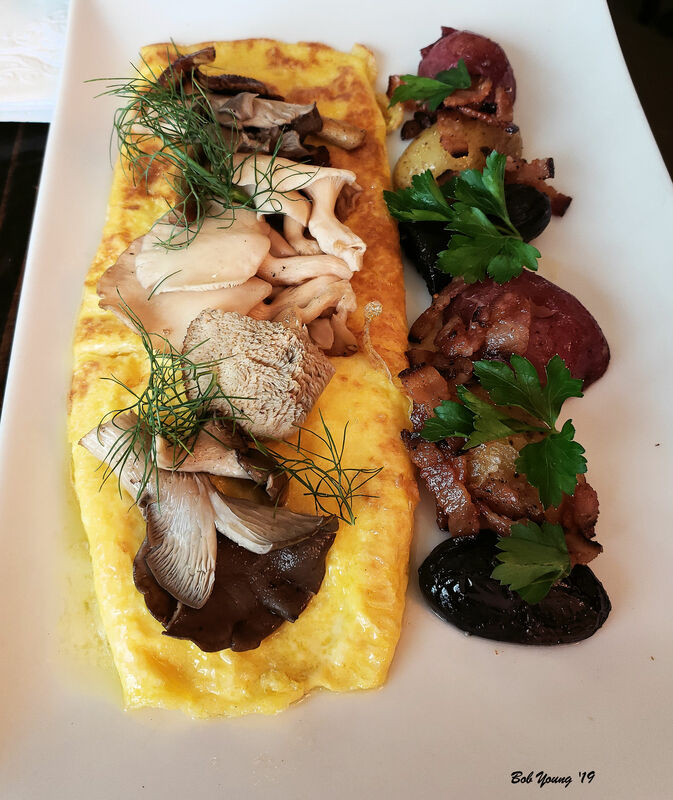 Easter Brunch and Special Menu, Sunday, April 21 from 11 a.m. – 5 p.m.
Limited Reservations remaining — Make yours today! We will be offering our regular menu and the new featured Spring items this weekend, Storm might also be adding a few specials of his own to practice for Easter Sunday! Join us for Happy Hour Friday from 4-6 p.m.
Mother’s Day Brunch and Special Menu, Sunday, May 12 from 11 a.m. – 5 p.m.
Buy 2 Bottles get 1 Free on Wednesday & Thursday at Parma Ridge! Mention this ad to take advantage of this offer in our tasting room. Please join us for a Ladies Luncheon & Crafting Event with @therustyboard! When: Saturday, April 6th 11:30 am.- 1:30 p.m. So many 9×12 choices! Pick a Pallet Sign to make for $26, Box Frame for $30 or Framed Chalkboard for $35. Pick what you want it to say and then RSVP with Payment by March 23rd. Instant Message Amy Watts at (208) 921-7616 or wattsfamilyof6@gmail.com for google form & option to pay via a link to square account. 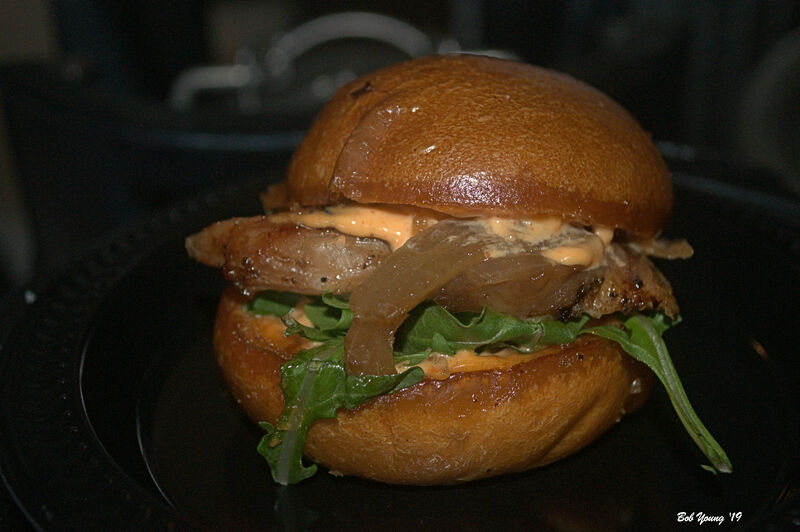 Parma Ridge will offer their full menu and wine, wine tasting and drinks so come hungry & thirsty! Space is limited so register today. These evenings are filled with fun! Enjoy excellent music, wine & beer and our fabulous cuisine. Our kitchen will remain open until 9 p.m. on nights we have live music. Reserve your spot today as space fills up fast! Cunningham and Moss, Saturday June 1 & Saturday September 14 from 5:30-9:30 p.m.
Don Cunningham and David Moss team up for this dynamic acoustic Duo. A little Rock a little Roll and a whole lotta Soul. Two Guys Two Guitars. Read more about Cunningham and Moss Here. Read More about The James Gang Here. Our one and only Nikki Barrett is the lead singer of this band. This Rockabilly/Hillbilly Band is sure to entertain the crowd! Read more about the RockIts Here. More Live Music Nights coming soon! We Bottled our 2018 Tre Bianchi, 2018 Avielle, Rosé of Merlot, 2018 Rhubarb Wine, and 2016 “The Bomb” – a blend of Cabernet, Malbec & Merlot last weekend. Watch the videos on our Facebook Page! 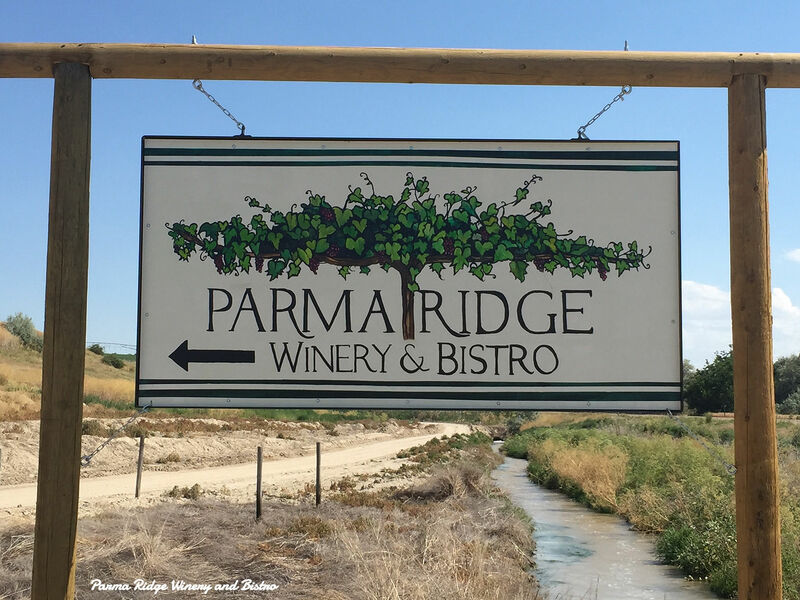 Have you seen the recent articles on Parma Ridge? Parma Ridge was featured in the AAA Magazine, thank you Nathan Leigh for the write-up on our location! 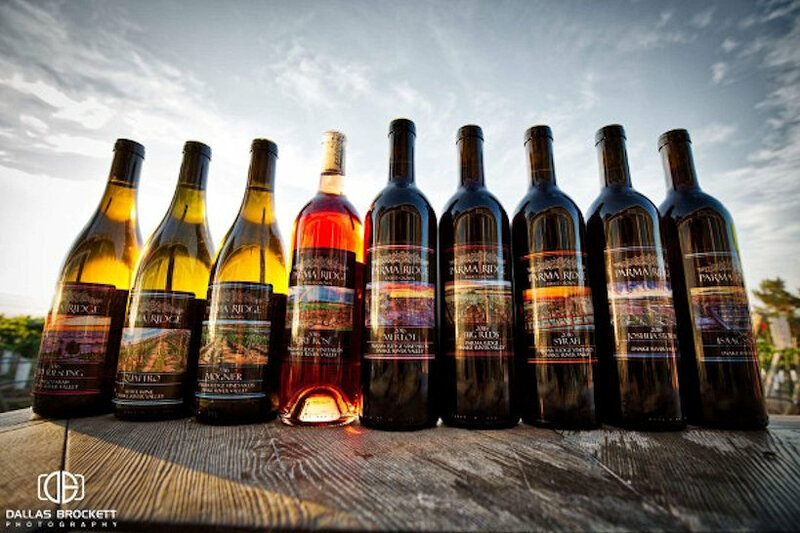 Parma Ridge was voted #1 Winery in Idaho By House Beautiful. See the line up here! 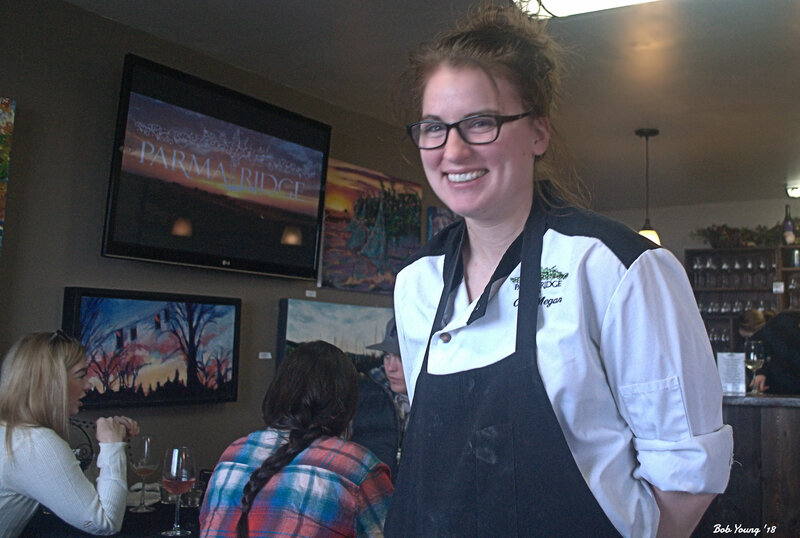 Have you seen the recent articles on Parma Ridge? 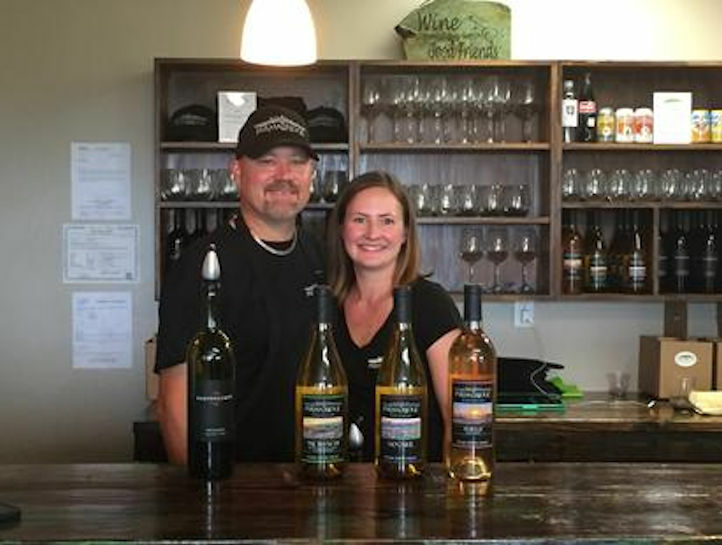 Parma Ridge was voted #1 Winery in Idaho By House Beautiful. See the line up here! 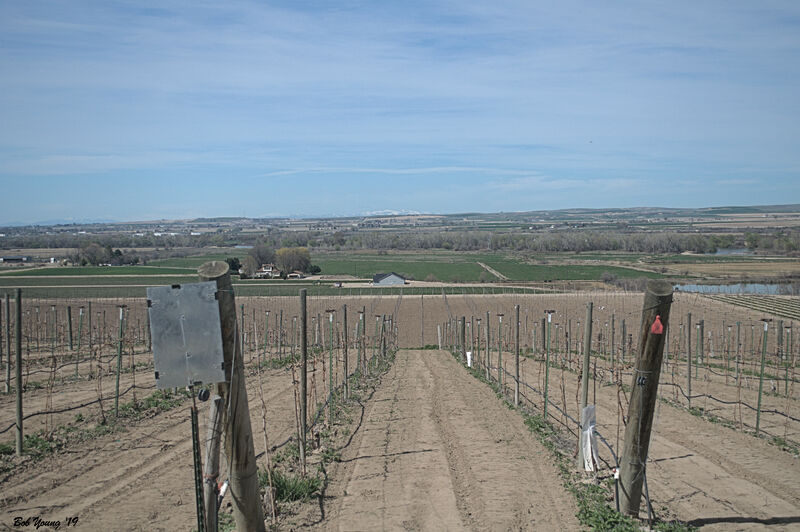 Great article by By Andy Purdue and Eric Degerman of Great Northwest Wine on the Idaho Wine Industry. Parma Ridge made the list with our 2016 Dry Rose of Merlot – Read it here! See you this weekend on the Ridge! Save the date for our Easter Special Menu — Make your Reservation today! I found this to be interesting. That’s probably because of my Cultural Anthropology background. Although it is not a national holiday, March 3rd is a special day for girls. Families who don’t have young daughters might not do anything special on this day. March 3rd is Japanese Girls’ Day or Hinamatsuri. Ornate dolls are displayed in the family home to mark the beginning of spring and to wish good health and good fortune for all of the girls in the family. However, a tradition of this festival is still passed down until now. Actually, how people celebrate Hina Matsuri is different from place to place. We will introduce here what the Japanese people usually do on this day. Hina Dolls represent what the imperial family was like in the ancient times. The dolls on the top tire of the platforms represent the emperor and the empress. The rest of the dolls are three court ladies, five musicians and the minister of the Right and Left who used to support the government in the old days. There are some decorations such as Gissha (oxcarts), small cupboards, Japanese paper lamps called “Bonbori”, and orange and peach tree branches displayed on the tire of platforms. The facial expressions and costumes of each doll are also different depending on their personality and position. The special meals for Hina Matsuri are Amazake (sweet drink), Chirashizushi (a style of sushi) and Hina Arare (sweet colorful rice crackers). 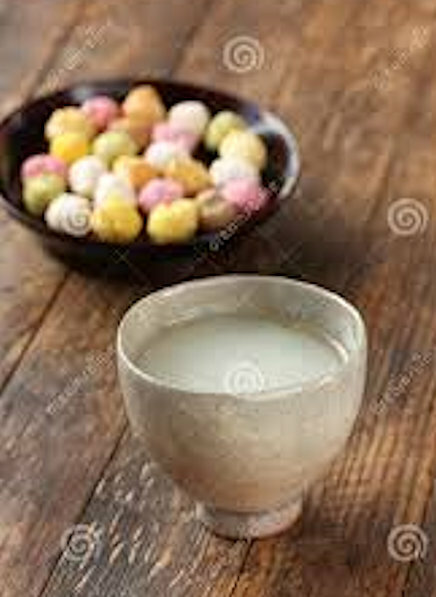 Amazake is a traditional Japanese sweet and thick drink made from fermented glutinous rice. Amazake literally means “sweet alcohol” but it has less than 1 percent of Shirozake alcohol in it. So children are also able to drink it. Drinking Shirozake, which is a traditional sweet sake, was one of the customs to get rid of bad things out from your body. But Shirozake is an alcoholic drink, so Amazake was made with the children in mind. Hina Arare are colorful and cute small rice crackers. The colors of these rice crackers have meanings. White represents the earth of the winter, pink and red represent life, while green represents the green shoots in the spring. Hina Arare is a snack showing our expectations toward the arrival of spring after the long cold winter. People also say that you will live healthy for this coming year if you eat each color of Hina Arare. Chirashizushi is a type of Sushi which has lotus roots, shrimp and thinly shredded egg omelet on the top of vinegar rice. It has been a dish enjoyed widely at celebrations. The ingredients in Chirashizushi have meanings as well. 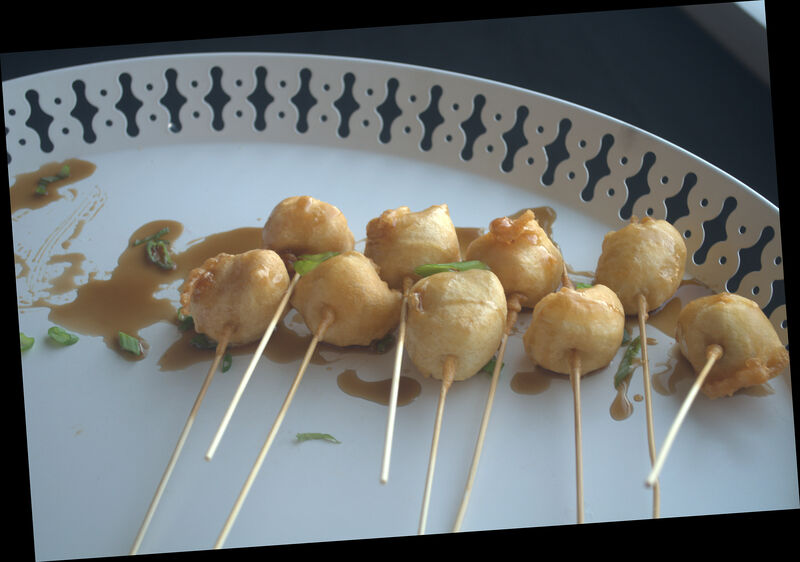 The lotus root is said to give one the power to see what will happen in the future, shrimps are a symbol of longevity and so on. As with almost all holidays, food and drink play a role on Girls’ Day, with rice wine and rice cakes taking center stage, along with flower blossoms. Hinamatsuri is also called Momo no Sekku, which means a festival of peach blossoms. Peach blossoms, shiro-zake (white fermented rice wine) and hishi-mochi (diamond-shaped rice cakes) are placed on the stand with the hina dolls. Hishi-mochi are colored pink representing peach flowers, white representing snow, and green representing new growth. Traditionally, girls in Japan invited their friends to a home party to celebrate this festival. Many people prepare a special meal for girls on this day, including savory dishes such as chirashi, which is sugar-flavored, vinegared sushi rice with raw fish on top; clam soup served in the shell; and edamame maze-gohan, mixed rice usually consisting of brown rice and soybeans. Other popular dishes to serve at a Girl’s Day celebration are inari sushi—rice-stuffed tofu pockets—with miso grilled salmon and cabbage ramen salad. Sweets are on the menu as well, incorporating a feminine shade of pink, like chi chi dango, which are pink pillows of mochi (glutinous rice flour and coconut milk), a favorite among children, and sakura-mochi, a pink, sweet rice cake. 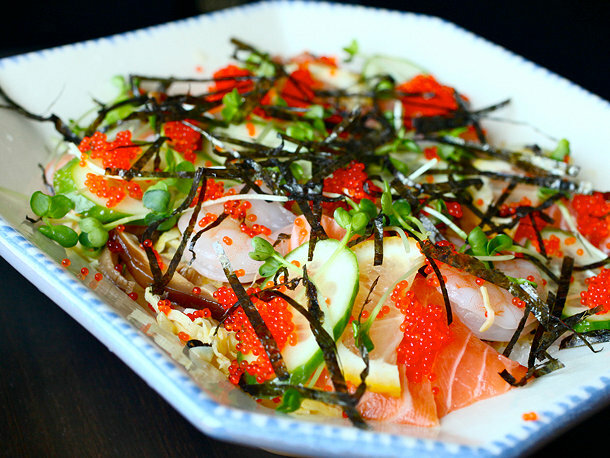 Some families include an impressive edible centerpiece, such as the layered chirashi sushi cake. Easy Seafood Chirashizushi: Use a shortcut of packaged sushi seasoning to quickly season steamed rice and add pre-cooked gomoku vegetables for this delectable dish. 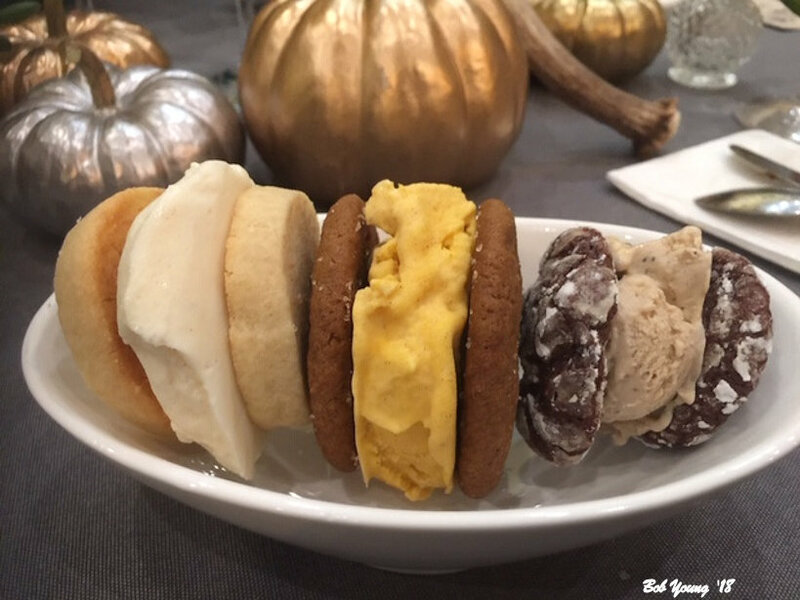 Add your favorite toppings of choice. Edamame Maze-Gohan (Mixed Rice): Is easy to prepare, especially for large crowds. Steamed rice is mixed with furikake seasoning, bottled nametake (seasoned mushrooms), and shelled edamame for a delicious rice dish. Inari Sushi: Preparing a dish for a large crowd doesn’t need to be complicated. Find out the secrets of making quick inari sushi with impressive results. Cabbage Ramen Salad: This spin on the traditional Chinese chicken salad recipe uses crunchy dried ramen noodles, cabbage, and shredded chicken to create a zesty Japanese-fusion salad. Slow Cooker Teriyaki Chicken Wings: Let your slow cooker do all the work to whip-up a batch of delicious teriyaki chicken wings with just a few ingredients, and use the free time to prepare a few other dishes. 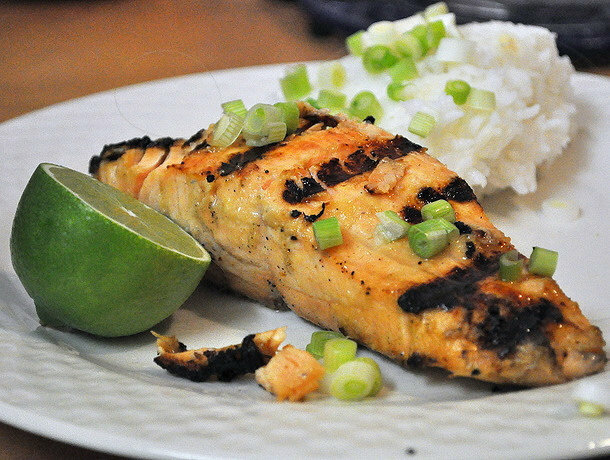 Miso Grilled Salmon: Miso-grilled salmon can easily be prepared by making the marinade ahead of time and then letting the salmon marinade for a few days in the fridge. All you need is an oven or a grill to cook up delicious fillets in under 40 minutes. Clam Soup: A traditional soup that is often enjoyed on Hinamatsuri is clam soup. This clear style soup is known as sumashijiru and is simply seasoned from the broth of the clams. Chi Chi Dango: These pillowy soft bites of mochi are made of glutinous rice flour and coconut milk. These pink, soft mochi are an absolute favorite among children. Sakura Mochi: Sakura mochi is a glutinous rice dish that is often enjoyed during Hinamatsuri. This slightly sweetened, pink mochi is filled with sweet red beans (koshian) and wrapped in a salted sakura (young cherry blossom) leaf. And it was a good feast! 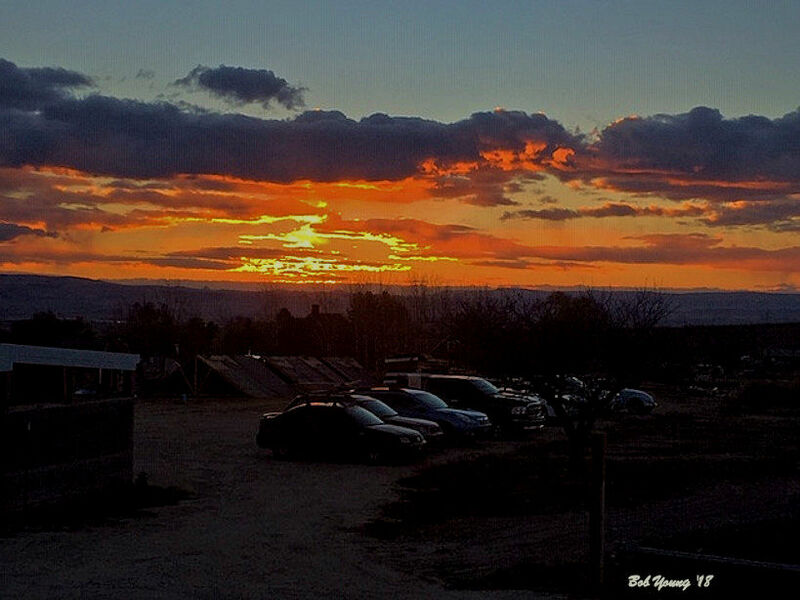 Held at Peaceful Belly Farm and the new event room and building – Grand Opening November 16–18, noon until 6 pm. The Farm to Table Dinner Series, “Josie of Peaceful Belly, Scott from Snake River Winery, Clay from Stack Rock Cidery, Nate Whitley chef at the Modern Hotel and Chef Abby Carlson have teamed up to create an amazing 5-course meal held on our magical Sunny Slope farm. 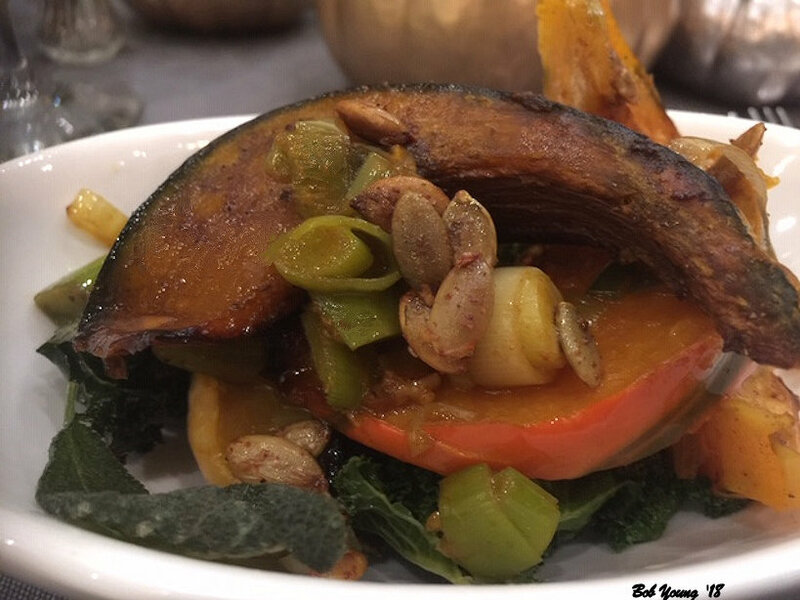 The plates are creative, unique, and 100% local and seasonal. 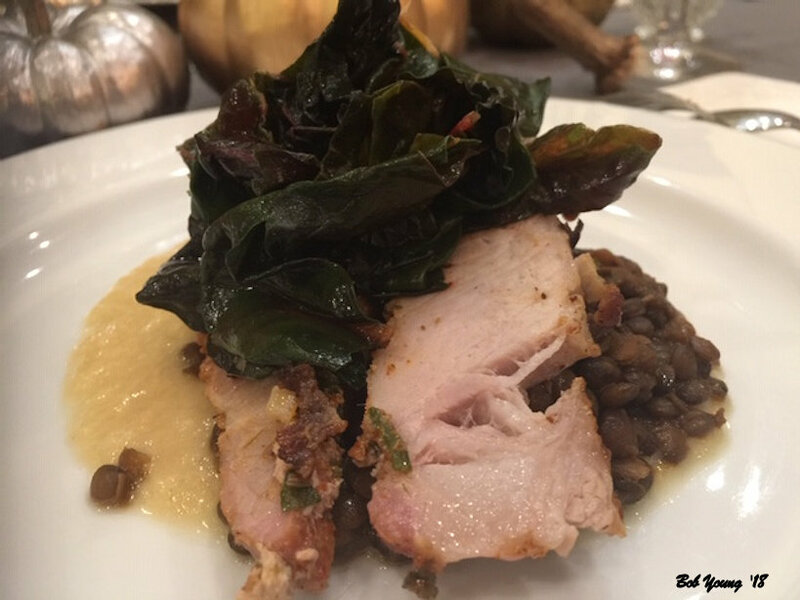 These dinners will transport you to another time and place where fresh food is cooked with amazing brilliance and presented to the table in a picturesque farm setting.” Here are some photos from the evening. Enjoy and Left-Click to see any of these photos enlarged. All in all – A good dinner. The menu for the dinner. 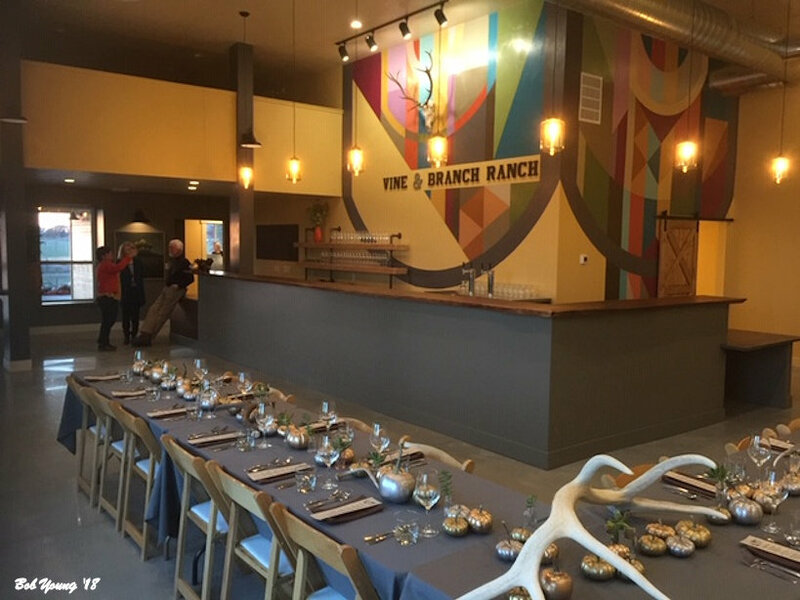 New event room and tasting room. What’s In A Wine Glass? The Burgundy Grand Cru was followed by a line of 10 more wine-specific shapes: Alsace, Bordeaux Grand Cru, Chardonnay, Hermitage, Loire, Montrachet, Riesling Grand Cru, Rosé, Sauternes, and Zinfandel. Today, Riedel makes dozens of specialized glasses; the company’s 2018 catalog specifies which of dozens of shapes are appropriate for some 200 different wines, which include familiar grapes like Malbec and Sauvignon Blanc (in oaked and unoaked expressions); less familiar grapes, such as Bacchus and Zierfandler; appellations, like Hermitage; and styles, like rosé. There’s a lot more information from Examining the Science of Wineglass Shapes. This is really an interesting article that Robin found. Enjoy! What is this thing called ….. Borscht? I’m not sure that Cole Porter or Ella Fitzgerald would approve of the title, but I think it is appropriate. Keep reading. “Borscht (English: /ˈbɔːrʃ, ˈbɔːrʃt/ ) is a sour soup commonly consumed in Eastern Europe. The variety most often associated with the name in English is of Ukrainian origin, and includes beetroots as one of the main ingredients, which gives the dish its distinctive red color. It shares the name, however, with a wide selection of sour-tasting soups without beetroots, such as sorrel-based green borscht, rye-based white borscht and cabbage borscht … Borscht derives from an ancient soup originally cooked from pickled stems, leaves and umbels of common hogweed (Heracleum sphondylium), a herbaceous plant growing in damp meadows, which lent the dish its Slavic name. With time, it evolved into a diverse array of tart soups, among which the beet-based red borscht has become the most popular. It is typically made by combining meat or bone stock with sautéed vegetables, which – as well as beetroots – usually include cabbage, carrots, onions, potatoes and tomatoes. Depending on the recipe, borscht may include meat or fish, or be purely vegetarian; it may be served either hot or cold; and it may range from a hearty one-pot meal to a clear broth or a smooth drink.” [Wikipedia] And “those other sour soups” that are cousins to borscht may come from day Lithuania and Belarus, the Ashkenaz Jews, Romanian and Moldovan cuisines, Poland, Armenia and even Chinese cuisine, a soup known as luó sòng tāng, or “Russian soup”, is based on red cabbage and tomatoes, and lacks beetroots altogether; also known as “Chinese borscht”. Wow! There are many varieties of borscht. But there is only one original or authentic borscht. Borscht derives from a soup originally made by the Slavs from common hogweed (Heracleum sphondylium, also known as cow parsnip), which lent the dish its Slavic name. Growing commonly in damp meadows throughout the north temperate zone, hogweed was used not only as fodder (as its English names suggest), but also for human consumption – from Eastern Europe to Siberia, to northwestern North America. So. What is borscht usually made of? What are the components? Ingredients? Borscht is seldom eaten by itself. 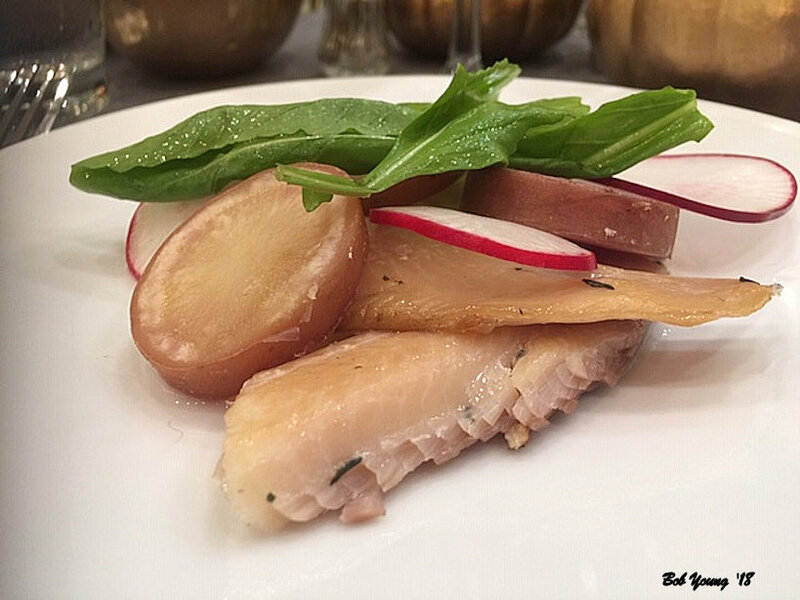 Buckwheat groats or boiled potatoes, often topped with pork cracklings, are other simple possibilities, but a range of more involved sides exists as well. 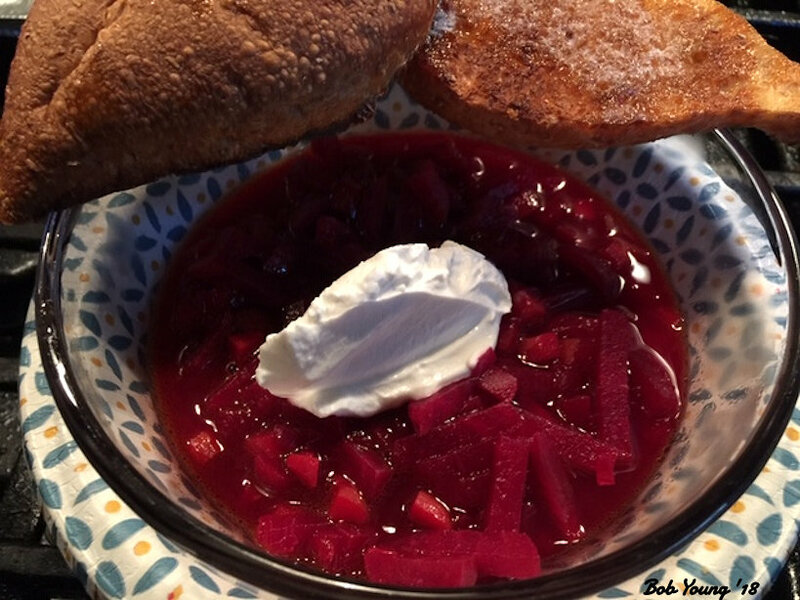 In Ukraine, borscht is often accompanied with pampushky, or savory, puffy yeast-raised rolls glazed with oil and crushed garlic. 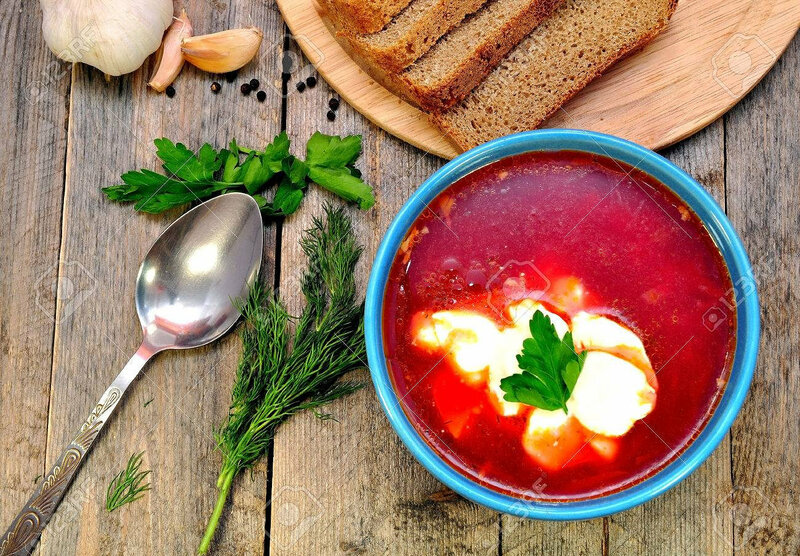 In Russian cuisine, borscht may be served with any of assorted side dishes based on tvorog, or the East European variant of farmer cheese, such as vatrushki, syrniki or krupeniki. Vatrushki are baked round cheese-filled tarts; syrniki are small pancakes wherein the cheese is mixed into the batter; and a krupenikis a casserole of buckwheat groats baked with cheese. But please note, your borscht may be different from your neighbors. There are cultural differences in the borscht. Ingredients may include,beet juice, beet root, veal, ham, crayfish, beef, pork, sour cream, buttermilk, yogurt, cucumbers, radishes, green onion, hard-boiled egg halves, dill weed, leafy vegetables, sorrel, spinach, chard, nettle, dandelion, cabbage, tomatoes, corn, squash, to name a few. So whatever inspired me to write this post? Well, we made a borscht and I posted a photo of it (the one pictured here actually) and I got comments. One of them in particular, from a Ukrainian lady, and she said,”That’s not real Russian Borsch (smiley face). It’s beet soup (smiley face). My mom makes the best, she is a Gourmet Chef for over 50yrs, and specializes in Jewish Cuisine.” [Mara Rizzio] I spoke to Mara – she makes awesome pirogies – and it was a good discussion. Thank-You Mara for “setting” me straight. Thus, this blog post. Cheers. And here is a recipe for Borscht that I found in the internet, from NPR, that includes various ingredients. Have fun! Borscht Recipe. Now is the time to add some spice to your life. At least the spices of North Africa – Ethiopia to be exact. From Demand Africa, “In Amharic, the state language of Ethiopia, ‘barbare’ means pepper or hot. 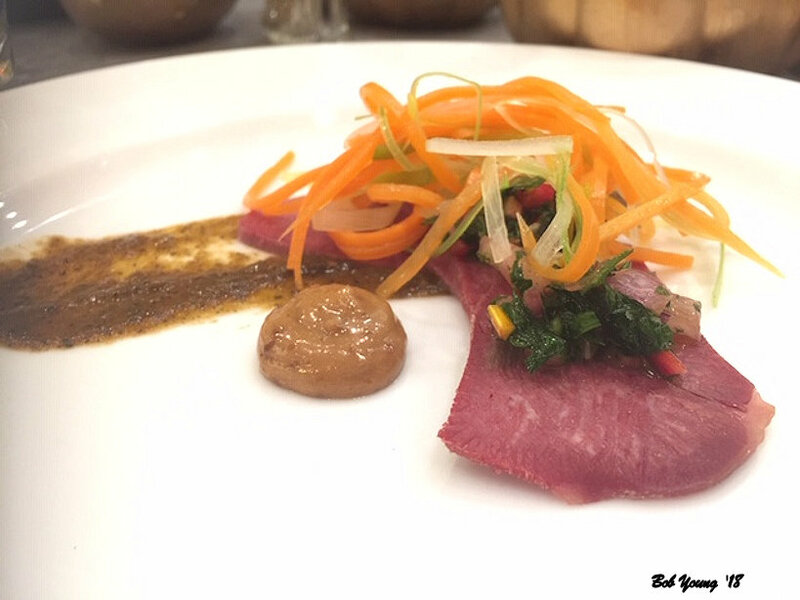 Not surprisingly, berbere spice, the flavor backbone of Ethiopian cooking, gives traditional Ethiopian dishes that fiery kick. 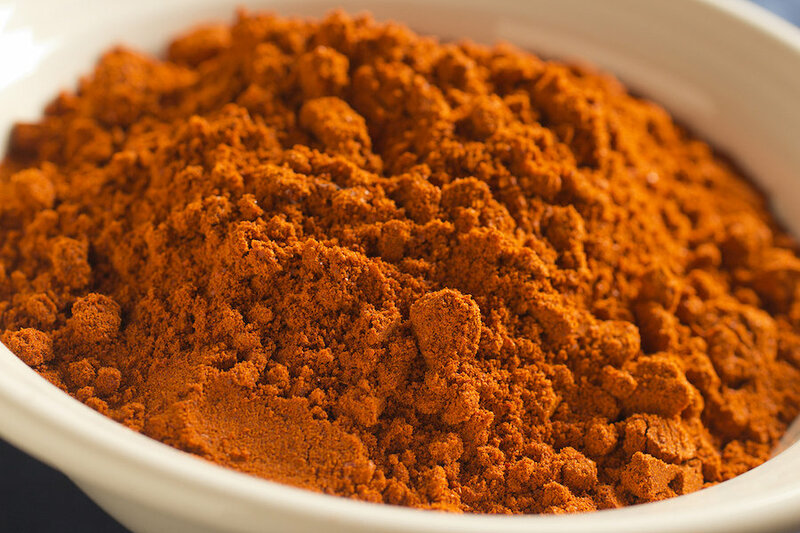 Berbere’s constituent spice is paprika (itself a ground spice made from Capsicum peppers), but the final blend could be made from up to 20 spices. Ethiopian cooks of old were not short of kitchen experiments, and over time have added garlic, ginger, fenugreek seeds, African basil, black and white cumin, nutmeg, cinnamon, clove, cardamom, coriander seed, thyme, rosemary, turmeric and ajwain (carom seeds commonly used in Indian cooking) to the mix. This allows berbere to impart a richer, aromatic and more layered flavor to any dish it’s added to, whether Ethiopian or not…Amharic language scholars speculate that the name ‘barbare’ came from ‘papare,’ the Ge’ez word for pepper (Ge’ez was the language of ancient Ethiopia). While that is likely lost in the mists of time, the more probable theory is that berbere came at a point in Ethiopia’s history when the independent Axumite kingdom controlled the Red Sea route to the Silk Road. The Axumites knew the secrets of the monsoon winds, and harnessed it to send their ships toward India in summer, and back again to Africa in winter…Berbere is the cornerstone spice blend of Ethiopia; without it, ‘doro wot’ or chicken stew (Ethiopia’s national dish) would not have that distinctive brick-red appearance and rustic, savory intensity. You can buy the spice blend in your grocery store – our Albertsons carries it – but it is more fun to make your own. All of these spices should be locally available. In a mixing bowl, combine all ingredients. Store in an airtight jar. Ethiopian cuisine (Amharic: የኢትዮጵያ ምግብ) characteristically consists of vegetable and often very spicy meat dishes. This is usually in the form of wot, a thick stew, served atop injera, a large sourdough flatbread, which is about 20 inches in diameter and made out of fermented teff flour. Ethiopian Chicken Stew -slowly simmered in a blend of robust spices. 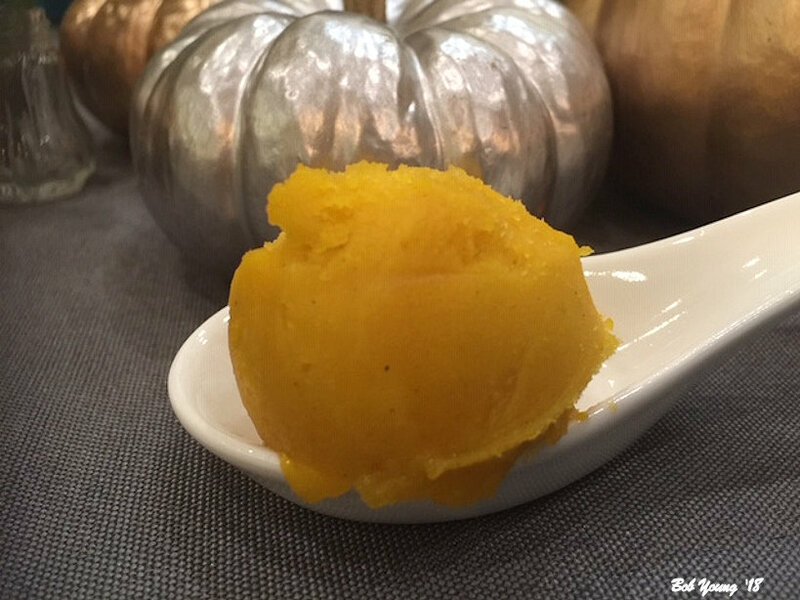 Easy thick, comforting, delicious, and so easy to make! In a large pot, over medium heat, heat until hot, and then add spiced butter and onions, sauté onions, stirring frequently, until they are deep brown about 7 -10 minutes. After the onions are caramelized or reached a deep brown color, add some more oil, followed by berbere spice, garlic, and ginger. Stir for about 2-3 minutes, for the flavors to blossom and the mixture has a deep rich brown color. Be careful not to let it burn. Then add about 2-3 cups water .Add chicken, tomato paste, paprika, basil, salt and cook for about 30 minutes. Throw in the eggs and lemon juice; thoroughly mix to ensure that the eggs are immersed in the sauce. Continue cooking until chicken is tender about 10 minutes or more Adjust sauce thickness and seasoning with water or broth, lemon,salt according to preference. 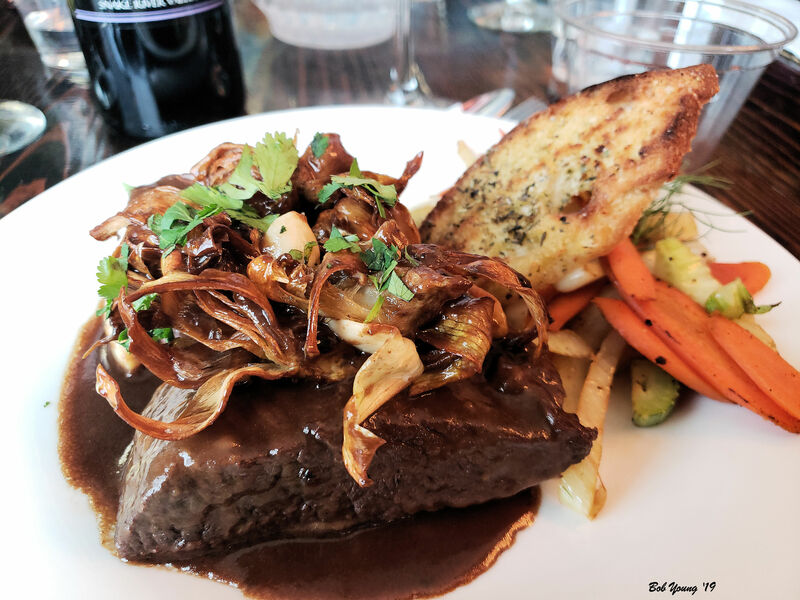 March 28, 2019 – Super Weekend at Parma Ridge Winery and Bistro! 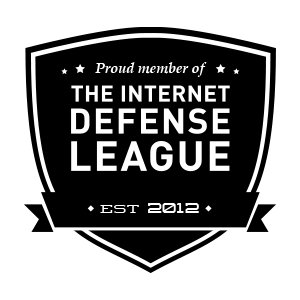 Translate this blog to your language. Ph (208) 422-7194 or EMail thesongwriter@gmail.com. Available for concerts and private affairs. 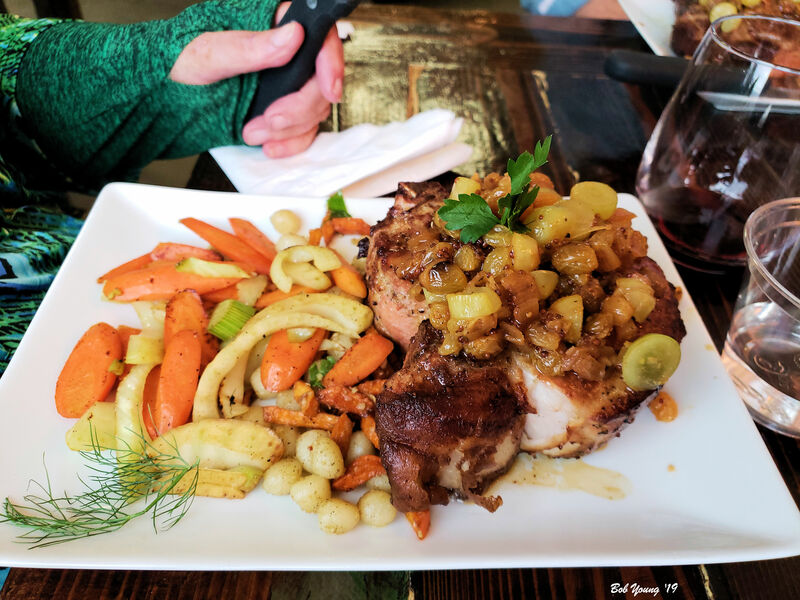 Winery Bistros – Good Idea to Call Ahead! Restaurants That Are Superb. Let them know you saw the info here. 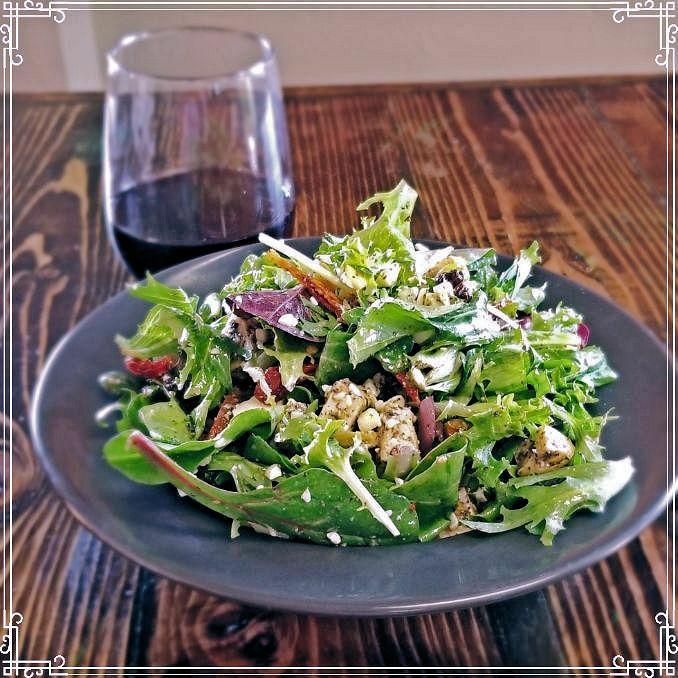 110 S 5th Street, Boise 83702 Monday – Friday 7 A.M. – 9 P.M. Saturday 9 A.M. – 9 P.M. Capitol Cellars is closed on Sundays.